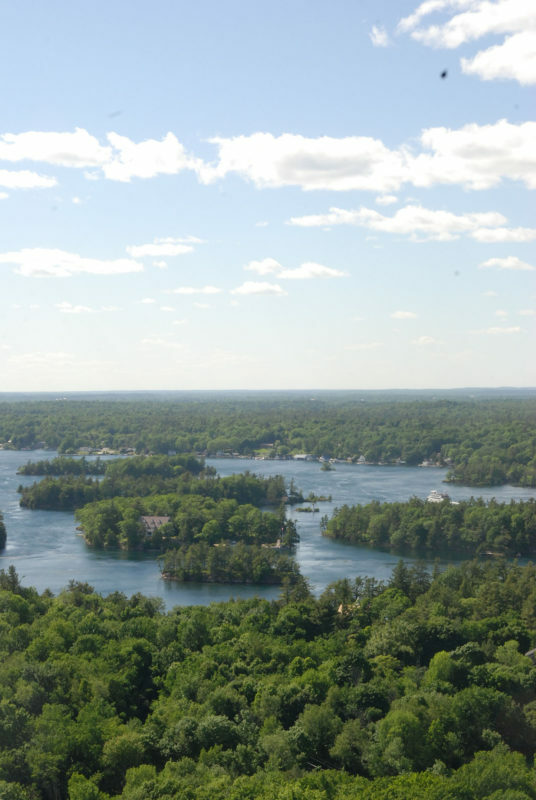 The 1000 Islands can be appreciated from many angles; on the water, along one of the many trails by foot or along the quiet riverside roads by car. But perhaps the most exhilarating view is from the air. 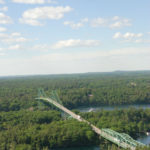 Some may get to experience this when flying over the region but everyone should make time to take a quick trip over the Thousand Islands Bridge and experience it in the open air. 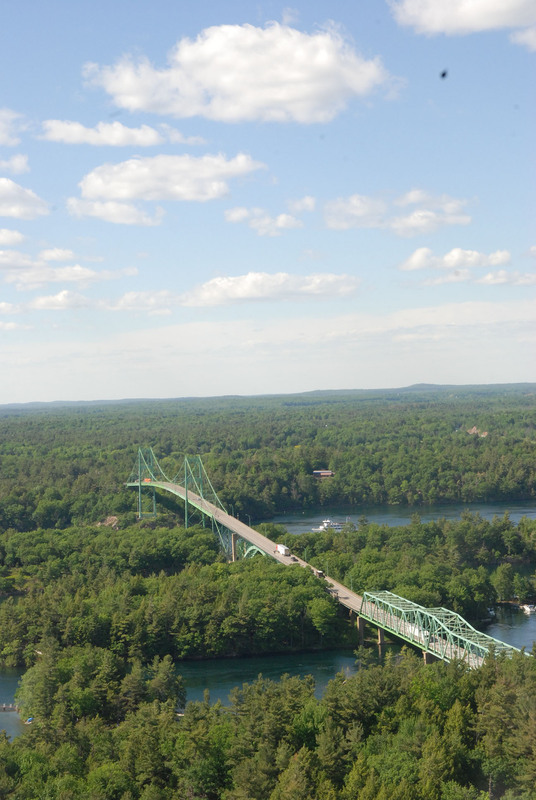 Just off the base of the bridge on Hill Island is the 130 m (400ft) tall 1000 Islands Tower. 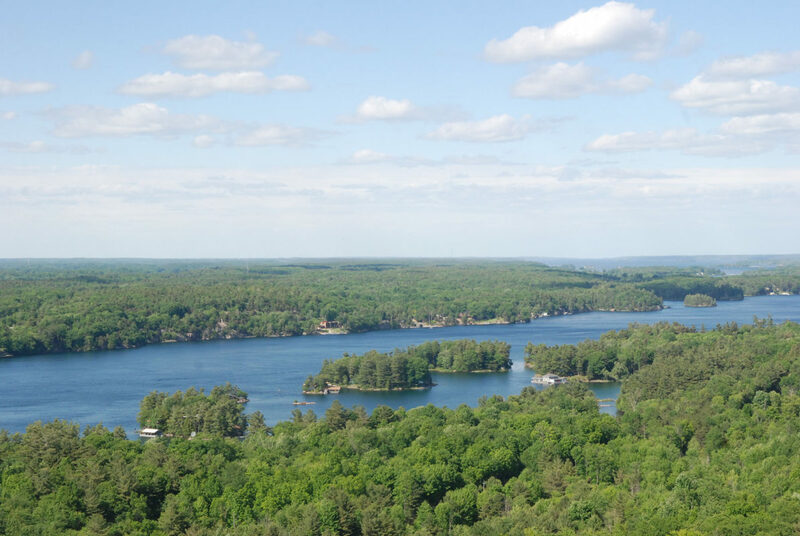 From the top you get one of the best-unencumbered views of the region anywhere. The tower was built in 1965. 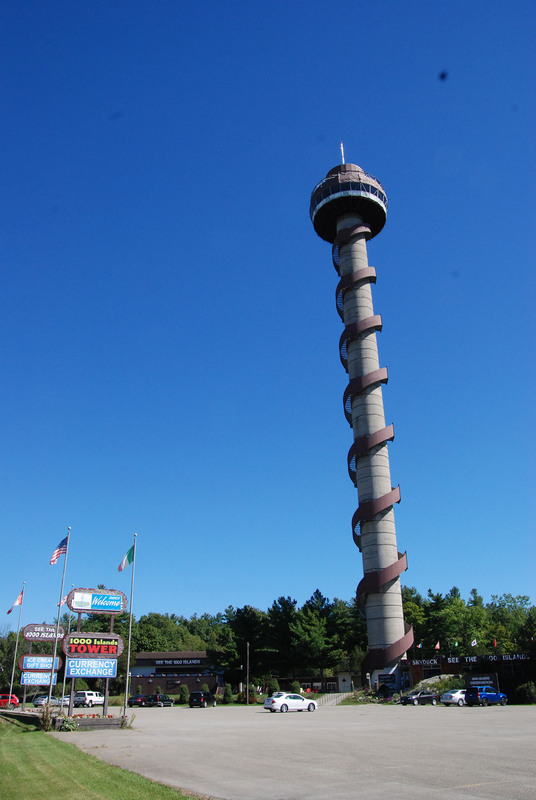 Back in the day, the tower might see 100,000 visitors a year at a charge of $.25 each. Visitors would climb the stairs that wrap around the exterior of the tower, but now an elevator whisks guests up to the first of 3 observation levels. 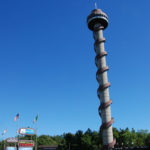 In 1984, Leonard Stratford and his wife Jean purchased the tower and ran the attraction until they wished to retire in 2011. The Stratford’s waited 2 years before the right buyers to came along in German immigrants Konrad and Heidi Linckh. The storybook tale began when the Linchks fell in love with the region while on Honeymoon in 2006. 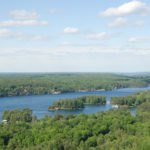 Konrad likened the beauty of the region only to that of an area around Stockholm, Sweden. They were so struck with the region, they applied for permanent residency in Canada that same year. Four years later, with permanent residency granted, they moved to Gananoque and began looking for opportunities to buy a business. This is when they discover the tower and fell in love with it’s 360 degree view. In 2012, Konrad found out the tower was up for sale. The Linchk’s put their life savings on the line and found kindered spirits in Leonard and Jean Stratford. 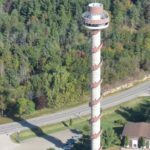 It took 5 short weeks and the Stratford’s agreed to sell Konrad and Heidi the tower and surrounding amenities saying “It’s not about the money, it’s about who’s taking it over”. Today, the Linchk’s and their son are working to re-energize the attraction and share the spectacular view from “their tower” with tourists and locals alike. 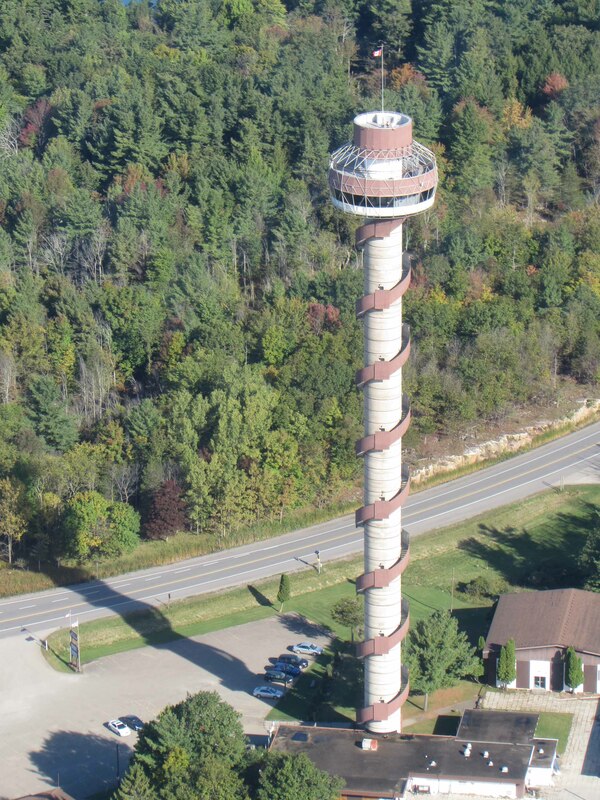 Click here for a beautiful aerial video of the tower and the St. Lawrence River. 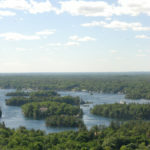 Paddling around the Thousand Islands Bridge, Georgina Island, Constance Island, and Hill Island is recommended for advanced paddlers only. The river bottlenecks here generating stronger and unpredictable currents as well as increased boat traffic. Closest access point is a boat launch in Ivy Lea. Driving: From the Canadian side: Take Exit 661 off Highway 401 onto Highway 137 south. Proceed through toll both and over bridge, after 500m the tower will be on the left side. From the U.S. side: Take I-81 to Canada, pass thru customs and the tower will be on the right side of Highway 137 after 500m. 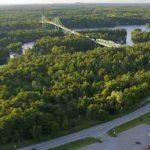 Walking: Pedestrians may cross the Canadian Span of the Thousand Islands Bridge using the sidewalk on the west side of the bridge (adjacent to southbound lanes) and is only open during daylight hours.